The Brewing Heritage Trail invites the world to explore Cincinnati through an unrivaled urban walking trail. Iconic markers and public art by nationally renowned artists are part of the experience, but not all of it. Physical installations along the Trail are supplemented by an app that provides additional stories, photos and augmented reality. 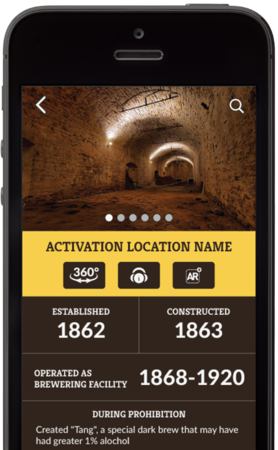 The Brewing Heritage Trail can be accessed at any time without charge, although visitors may also choose to explore the Trail through guided tours or audio guided apps. The Trail celebrates a proud tradition of quality beer, and it embraces a Cincinnati perspective, but it transcends both beer and local history. The Brewing Heritage Trail shares stories about our collective American past. As a destination or a casual walk, it is an entertaining and informative experience. The Brewery District CURC and its partners are also building this trail to help preserve our past and to promote the architectural legacy of nineteenth century breweries. Learn More About The Trail: The Brewing Heritage Trail is an urban walking path that explores Cincinnati’s history through beer. Explore the Brewing Heritage Trail and surrounding Over-the-Rhine. The Trail is free and open to the public 365 days a year, 24 hours a day. Let the map be your guide. More About The Trail - Brewing did more than any other single industry to shape the culture of the Cincinnati. Building The Brewing Heritage Trail requires partners and benefactors. Whether you want to take advantage of a sponsorship opportunity, are willing to make a donation or volunteer for an event, or are just willing to do your part by taking a guided tour or wearing the Trail, please Get Involved. The Brewing Heritage Trail follows a route that winds through a nationally unrivaled collection of brewing heritage sites.Visitors enjoy the trail through iconic signs as well as additional photos, stories and augmented reality experiences that can only be accessed by downloading the app. Note that the Android app is temporarily unavailable as we switch hosts.